What's BUg'in you? Weather, people, the economy, work, or just sheer boredom? Join us for some great music at Brisbane Unplugged on any given Tuesday night and you will catch the BUg too. We went to this quirky venue one night, not realizing what we were getting into, but it has become one of our favorite things to do on the occasional Tuesday night. Long, stressful work weeks should always have at least one night of chill out, folksy, bluesy, soul satisfying, talented and sometimes unexpectedly quirky music. But beware, once bitten, you might become smitten. Minutes after the music starts, and the beer kicks in, I promise you, whatever WAS "BUggin" you, won't be anymore. If you love to sing and play instruments, and want to perform, come early and sign up on the blackboard for a 10 minute spot of your own. We'll clap for ya and cheer ya on. Probably not a surprise to locals, but this venue is at the New Farm Bowls Club on Brunswick, across from New Farm Park, thus the "quirky" setting for newcomers like us. You can take Bus 196 or 199 to get there, with 199 letting off up the street on Merthyr and 196 stopping right at the bowls club. The club offers a menu of modestly priced items. I had the fish and chips and it was pretty good. It is a cheap date night too because it's only a $6 entry fee with a $4 concession. Bring a few extra dollars, because they have a raffle and you might win a bottle of wine. Some nights the place is packed and other nights it is very low key. 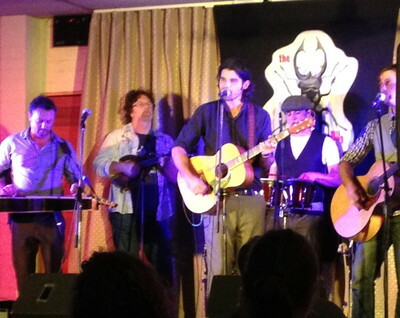 Check out Brisbane Unplugged online. You can review past and future bands to see who is playing. Many of the artists and groups also have Myspace, Facebook, YouTube and iTunes sites where you can go to hear a few samples of their work. 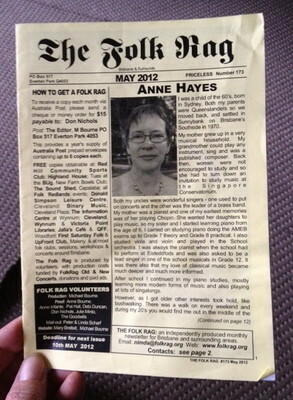 Also, you can check out "The Folk Rag", "An Independent monthly Folk newsletter which covers Brisbane & surrounds" for schedules, reviews, photos, interviews, and more. On that note, being new in town, we haven't heard a lot of bands yet, but following are some of the folks we have really enjoyed listening to at The BUg. The Lamplights are upbeat, positive, fun, and de"light"ful. Listening to them is an experience. You will find your toes tapping, your hands clapping and a smile on your face. Quality and joy are important to them, and it shows. The Lamplights want to bring light into your lives. When you buy their CD at an event, they suggest you pay whatever you may think it is worth to you. Read their beautiful bio and follow their Facebook page to find out where you can find them playing next. Another favourite for us is The Switch. I don't know quite how to describe how they sound, but how they feel is rich and comfortable and a bit different. It's hard to believe that their impressive musical fusion comes from merely three people. Find The Switch playing around town and I'm positive you will appreciate their version of folk, blue grass, country style music. Sue Wighton is a talented, entertaining classic. Very versatile; folk, blues, bluegrass, jazz, country, she can be found singing solo or as part of The Unsung Heros . Wighton is warm, witty and engaging in person, feels like you are listening to a good friend perform. Check out her humorous song about revenge,"I Know Where you Live". Finally, Mama JuJu's soulful voice and Sugar Cane Slim's guitar, ukulele & blues harp kept us entertained. Her song, "Keep it to Yourself" about love gone wrong, had us laughing. Rich, soulful, and entertaining. For more of "Brisbane's Best Live Music Venues" read this article by Carly Ogborne. More articles by Holly G.
View all articles by Holly G.